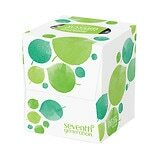 For soothing comfort for colds, allergies and even tears, choose gentle and strong 2 ply tissues. Some facial tissue has a hint of lotion to moisturize irritated skin. 2 ply tissues from popular brand Kleenex are available in decorative boxes and different sizes to meet your household needs. Choose a decorative box of 2 ply tissues that complements your d�cor, so you can leave it out for easy use for you and for guests. You can also find tissue packs that are convenient for keeping in your purse, pocket or car. Choose a facial tissue paper that's strong enough to stop sniffles or remove makeup, and gentle enough to be comfortable on your face. Other paper products include bathroom tissue available in scented or unscented, double rolls and toilet paper to go. 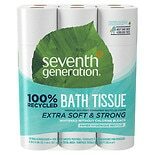 You can also stock up on trusted brands of paper towels that can help clean spills or dry hands. We carry paper napkins, as well, in different sizes and designs to meet your needs.